Ideal for use in night or indoor games the Thermobaric Grenade produces a dazzlingly bright flash but with very little noise, this can distract other players to enable you to change positions or just get the drop on your opponents. To use it is easy as can be. A quick shake, twist off the cap and use the end to strike the exposed fuse, like a safety match. 7 seconds later the grenade will burst with a stunning bright light. The low volume of the report makes this a great choice for game areas where noise pollution is a concern. 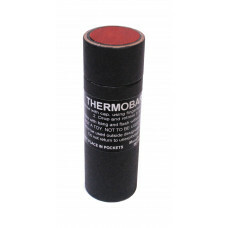 Tag your photos using #TLSFx_Thermobaric on Twitter and see them here. The TLSFx M11 multi burst canister grenade, using the third generation fly off lever system, is a di.. This is the multi shot variant of our popular Thermobaric grenade. The same dazzling and distracting..